After having giant cinnamon rolls this morning we went to church. The choir, which Mickey and I were in, sang a beautiful cantata. I got the kids home and started the ham we were taking to his parents' house for dinner. We were kind of rushing out the door to get there on time and somehow managed to not be the last ones there. We forgot the flowers. We turned around to get them. We made it to our destination without any other problems. I grabbed my purse and for some reason had a glance at my feet and thought, Oh crap! How did I leave with those on? 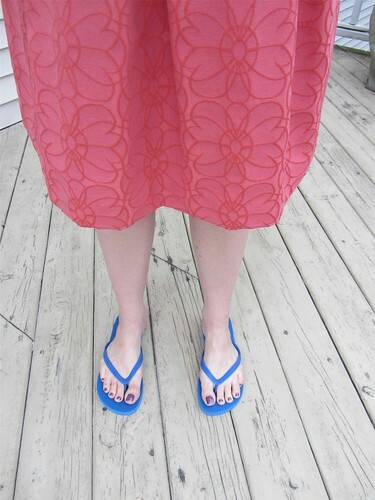 I was wearing my beautiful Easter dress and a pair of non-matching/non-coordinating house flippers. I blame it all on Mickey. He's always rushing me out the door. Sometimes I need two more minutes to make sure I have everything that I need (and go to the bathroom). At least this was only his parents' house and not church. I would have been mortified. I would have had to go home to change.